Clearing snow may seem as easy as switching on your snowblower and going at it, but there’s actually a bit of a science involved. Here are some tips on the techniques you should be using to ensure you clear your drive safely and efficiently. It may sound obvious, but pointing the chute of your snowblower in the direction the wind is blowing will save you a lot of time and stress. It’ll help keep snow on one side instead of drifting back onto your drive, and speed up the process immensely. But watch out for wind changes when you’re clearing snow, as you may have to adjust as often as mid-turn. Along with pointing your thrower down to make wind as much a non-factor as possible, you’ll also need to know what to do if you encounter cross winds. There’ll be no avoiding it, so the best way to forge ahead is to start on the upwind side and work downwind. Now you have to figure out where the snow will be landing. Make it too close to the road, and you’ll run into problems of not being able to put your garbage cans at the curb, creating bad blind spots when you pull in, and giving city-run snow clearers that much more to push onto your driveway. But put it too close to your house and you run the risk of the snow melting against the wall and causing interior water damage. And while plants, small trees, shrubs, and flowers generally like a blanket of snow to keep them insulated during the winter, too heavy a layer can crush and kill them. Instead, aim the snow onto your lawn, your backyard, at the bases of large trees, and even your neighbor’s property (if you’re lucky enough to have a good-natured neighbor). One last tip: don’t aim snow at cars or vehicles, as your snowblower could pick up ice chunks, gravel or debris, possibly damaging whatever it lands on. Starting in the middle of your drive is the best place for two reasons: you’re throwing the snow the farthest it needs to go, and you’re guaranteed not to throw snow over anything you’ve already cleared. As far as patterns go, you’re not beholden to any one way, but one stands out above the rest. If you’ve ever watched a Zamboni clear a rink between hockey periods, you’ll know that they start in the middle and make outward concentric laps because the water will always spit out the same way. 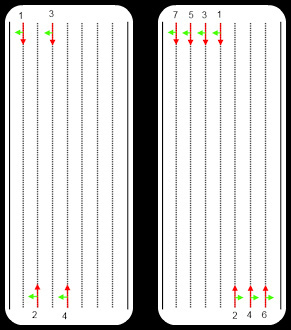 The diagram on the left shows the snowblower starting on side of the driveway and making turns. This isn’t very efficient because the thrower will alternate the direction if faces, and because you’ll be making very tight turns the entire time you’re clearing. 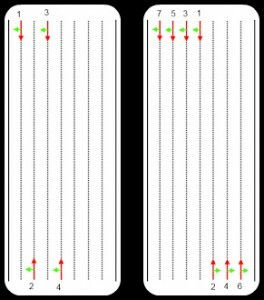 But in the diagram on the right, clearing in outward concentric circles helps keep your chute always pointed in the same direction, as well as make turns increasingly easier as they get wider. Whether you go clockwise or counterclockwise depends on the wind, but this method is definitely the best, easiest, and most efficient. 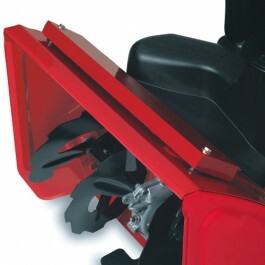 Make sure you’re using the right technique this winter with a Toro or Ariens snowblower, the two machines that give you the best fighting chance. And when you order with Snow Blower Source, shipping is FREE to the lower 48 states. You’ve just bought a brand new Ariens or Toro snow blower and it works like a dream: the engine purrs, the skid shoes give good traction, and the chute flings snow away with the ferocity of a mountain lion. But this newness won’t last, and it’s up to you to maintain your snow blower so it keeps working like new. The engine on your snow blower is the heart and soul of the machine: it ticks on faithfully, doing all the grunt work with none of the glory. Keep it in good shape, and it’ll be your companion for a long time. Regular oil changes aren’t just for cars. 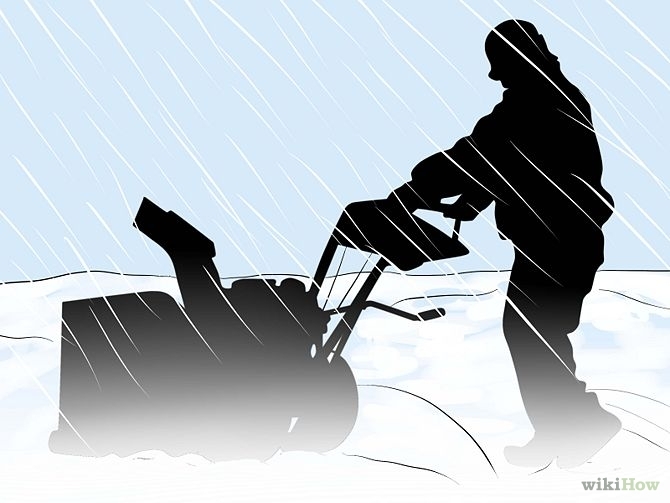 Each time you use your snow blower, you should be checking the oil level to make sure you have enough. If there isn’t, all the moving parts will dry up, scraping against each other as heat causes them to expand, and your engine will seize up and suffer an untimely end. The spark plug forces electricity across a gap, creating the ignition your snow blower needs to start up. Three big signs that your spark plug is telling you it’s time for a change are engine surges and/or misfires, trouble starting your snow blower, and a rough or jittery sound when it’s idling. Always make sure there’s fuel, and only change your air filter when it’s absolutely caked with crud. Now that the core of your snow blower is in good shape, it’s time to take a look at tires, drive and chassis, and chains. First make sure the scraper bar and skid shoes aren’t worn away, and that the rubber fits snugly on the auger. If you cant fit a finger between the rubber and the housing, it’s time for a shopping trip. 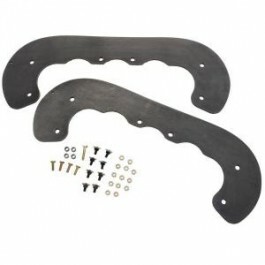 The skid shoes are what keep the auger from getting scraped on stones and the ground, while the scraper bar is what allows the snow blower to get close to the ground and pick up the maximum amount of snow. Take a look at the tread and inflation of your tires. Are they full and hard, and still have their grooves? If either answer is no, replacing them is going to have to happen soon. The tires are the main points of contact between the snow blower and the ground, and you want to make sure they’re doing their job. If you use chains on your tires, make sure they’re on in advance or easily accessible. 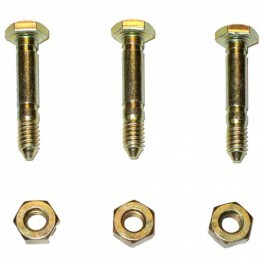 The last thing you want to ignore are all the small parts like shear pins, bolts, headlights and electric starters. Although these aren’t always visible, they’re the little soldiers that sacrifice themselves in mechanical overloads so more expensive equipment stays undamaged. Located between the auger and gear casing, the shear pins and bolts should all be there, and it’s a good idea to keep spares on hand just in case. It’s not crucial that your headlights are always working, especially if you only use your snow blower during daylight hours. But you just never know if a bad snowstorm will hit during the night and you need to plow a route from your garage to the road. A lot of snow blowers also come with a recoil start option, but if your’s is electric-only, or if you vastly prefer an electric start, this is one part that should always be on your horizon. Check it a few times a season just to make sure it’s working fine, and replace it before it starts giving you fits. The more time you spend with your Toro or Ariens snow blower, the more in tune you’ll be with it. Check out Snow Blower Source for an amazing selection of single stage and two-stage snow blowers, and get FREE shipping to the lower 48 states! When most people think of snow blowers, they visualize a utilitarian machine that’s designed for one thing, and one thing only: clearing snow. But with a little creativity, you can turn your snow blower into a winter weapon of fun. This one requires you to have a fairly sizeable property, but that’s about it. Just wait until you’ve accumulated a decent amount of snow, dust off a heavy-duty snow blower, like the Ariens Deluxe Track 28 (now conveniently on sale) or Toro Power Max 826 (also on sale right now), and go at it. First, measure the area carefully and scale it down on graphing paper. 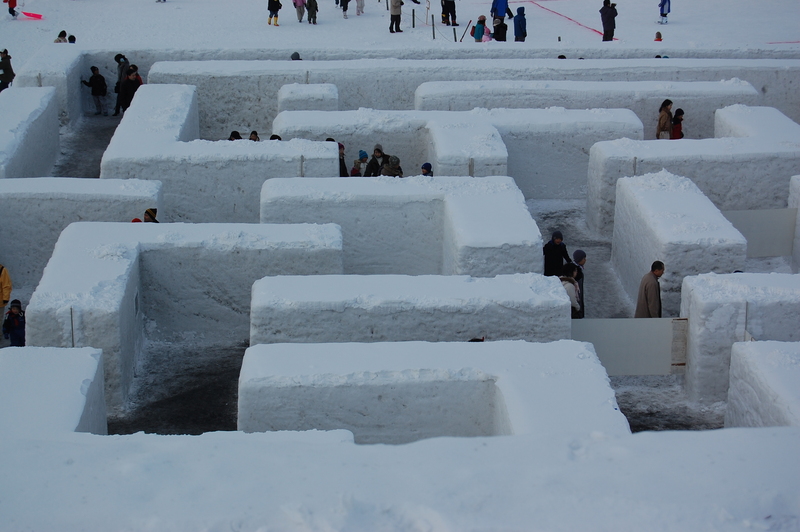 Design your maze on the paper, grab a can of spray paint, a large roll of measuring tape and a toque, and head outside. You’ll want to walk out the maze you’ve drawn, spraying dots, dashes or a line in the snow. The color of paint spray you use doesn’t matter a lot, but choosing a lighter color will look a bit better in the long run. Once you’ve spray painted the maze in the snow, stick cardboard or plywood on either side of the path so you can create snow walls, and then take your Toro or Ariens two-stage snow blower (you’ll need a two-stage because of how much snow there’ll be to power through) and blaze a path through the snow. The last step is just packing the snow tight against the temporary walls and then removing the cardboard, and laying down a bit of sand on the ground to create a delineated look. Voila! 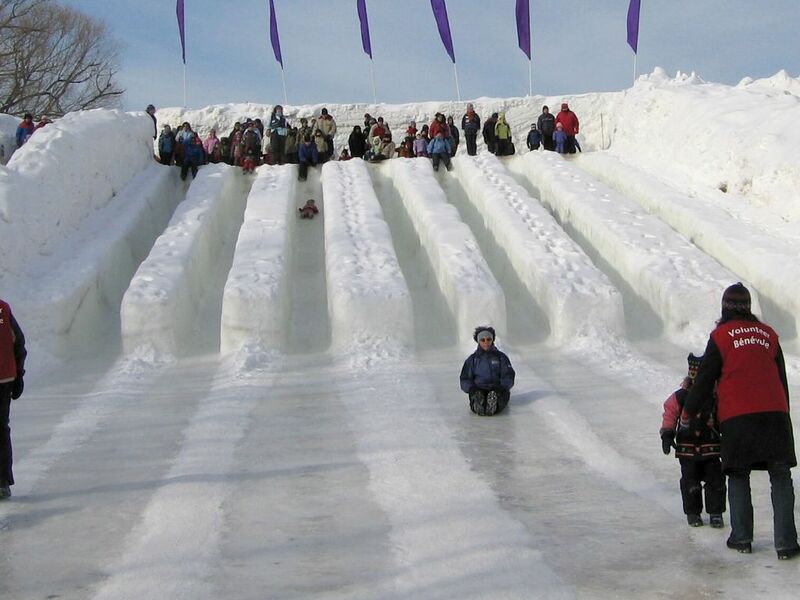 A snow maze you can enjoy all season! Making a pile of snow with your Toro or Ariens snowblower is a lot easier than making a snow maze for several reasons: all you have to do is blow snow into a pile, you don’t necessarily need feet and feet of it to have fallen, and there’s no drawing or paint spraying involved. A slight variation on a tobogganing hill, a race course is pretty similar except you create lanes separated by walls on the hill. A two-stage Ariens or Toro snow blower, while usually terrific at carving a path, won’t be good here because you’ll have to take a snow blower down the hill to create walls. Measure each lane about 2 to 2.5ft wide and slide down it a few times first on a toboggan or Magic Carpet to create a workable groove. Next, use your single stage snow blower, like an Ariens Path Pro SS21 or Toro Power Clear 418, to carve ruts. You’ll want to keep three things in mind: put up cardboard or plywood on either side to help create walls for the race course; raise the scraper blades so the snow blower makes less contact with the snow, letting you keep a layer of snow thick enough to slide on; and make sure you descend the hill safely with your snow blower. To do the last bit, you can guide the snow blower up the hill for better traction than simply walking it down. But the safest way of doing it is to loop a strong rope around the snow blower handle and guide it down the hill from a safe vantage point at the top. Or, if you have another body to help you, you can create a pulley system with the rope so you’re holding one end at the top of the hill, easing it down, and the person at the bottom is manoeuvring it in a straight line. For all snow blowers at Snow Blower Source, find the one that best suits your needs by browsing our selection. And remember, all snow blowers are shipped FREE to the lower 48 states! 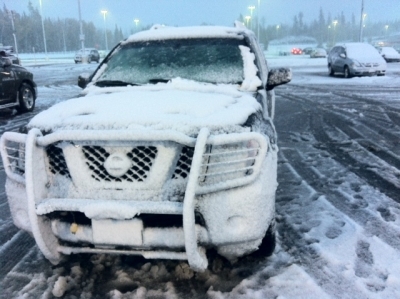 It’s only the beginning of November, but snow has already fallen in Spokane, Western Idaho, Edmonton, Pipestone (Minneosta) and Kenora, meaning it’s already time to bring out snow blowers. Along with snow blowers, you can use an assortment of other snow clearing tools to make sure your drive is clear and safe for the upcoming season. Snow blowers are by far the easiest, cleanest and most efficient tools to use for clearing snow. Their heavy-duty motors do all the hard work for you, staying close to the ground and getting at all the snow no matter how thick or heavy it is. And with a one-time cost (or a bit of ongoing cost for gas snow blowers, like the Toro Power Clear 621), all you have to do is plug in the snow blower and be on your way. Whether you opt to go the solely electric route, like using an Ariens AMP 24, or with a gas-powered Toro, Snow Blower Source has the perfect snow blower designed to suit your needs. Your basis compound of Sodium Chloride has been used to clear snow for what seems like forever. It works by lowering the freezing point of snow and ice, keeping it at a liquid when it would normally otherwise solidify. If water freezes at 32F, you can use a 10% salt solution to bring down the freezing point to 20F, and a 20% salt solution to get a freezing point of 2F. The ice immediately around the salt starts to melt and because water naturally likes to occupy the lowest space possible, the melting area spreads and clears more ice. The downside, of course, is if the weather outside is colder than what you can manipulate the freezing point to be, salt loses its efficacy and you have to use more. Although it looks like sand melts snow and ice much the same way that ice does, the process is fairly different. Snow and ice have a hard time retaining light- and heat/energy from the sun’s light- so it tends to reflect most of the heat and energy that hits it. But when you put darker-colored sand on top of snow and ice, it does retain heat and energy, bringing it up to a higher temperature than the snow and ice underneath it. And if you place a warm object on top of a cool object, the heat from it will transfer through until both objects are the same temperature. 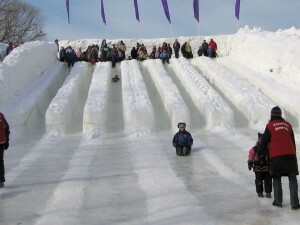 Because sand gains heat very quickly, placing a layer of it on top of snow is an easy and efficient way of melting it. However, it does leave behind a dirty-looking mess that needs to be cleaned up, but the grittiness of sand-on-snow makes driveways and sidewalks a lot easier to walk on. This winter, clear your property with one of Snow Blower Source’s Toro or Ariens snow blowers and get the peace of mind you deserve. Not only is shipping insurance included on every product, but the shipping costs itself are free for the lower 48 states.